What Are Critical Angle Refractometers? Critical angle refractometers use the principle of critical angle refractometry by which dissolved solids content is related to the refractive index of the solution. The basic refractometer unit unit consists of a sensing head and control console. The sensing head is mounted on the adapter installed in the process line and the process solution is usually viewed through a transparent window. The surface of the solution, which is in contact with the window, is optically scanned by an octagonal prism. The refractive index is determined by a beam of light from the prism which repeatedly sweeps at a varying angle at the surface of the solution. At a point in the cycle, as the angle between the incident light beam and the surface decreases, the light beam instead of refracting into the solution is reflected back into the optical system. The point of change from refraction to reflection depends on the refractive index of the solution and is known as the critical angle. The prism scans the beam of light through the critical angle. A photodetector measures the alternating light and dark periods and its electrical output is used to provide a readout of refractive index in the required units (R. I., % concentration, degrees Brix., etc.). 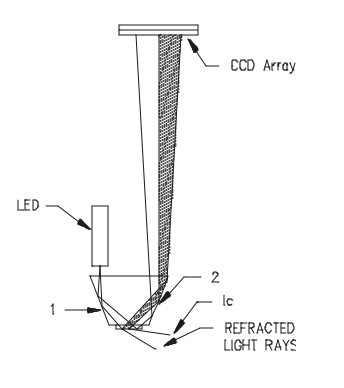 Critical angle refractometers use an LED as a light source and utilizes state of the art CCD (charge coupled device) technology to accomplish scanning the reflected light returned from the prism. Light radiated from the LED passes through the prism surface to be reflected off mirror 1 to the prism-to-process interface. The light reaching this interface intersects the same interface over a series of angles chosen to include critical angle for the process being measured. Light intersecting the interface at an angle greater than critical angle is refracted into the solution. Light intersecting the interface at less than critical angle is reflected up to mirror 2 and out of the prism up to the CCD linear array to be scanned. A principal advantage of critical angle refractometry is that it measures the index of refraction at the surface of the process solution. Since the light beam does not penetrate into the solution, the instrument can be used for opaque as well as transparent materials.